Since the late 1990s, the City of Rahway has rebounded as its downtown began to see the construction of new restaurants, art galleries, market-rate housing, the reopening of the old Rahway Theatre as the Union County Performing Arts Center, as well as a refurbished train station and train station plaza. 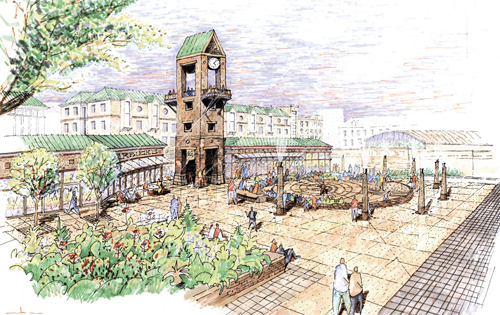 The Rahway Town Center Master Plan, which will create a new mixed-use public square, builds on this trend of redevelopment in the city’s downtown. The Town Center Master Plan was conceived with the goal of reinforcing the city’s civic center. It will add a multi-use public plaza, framed by City Hall, the library and recreation center, as well as high-quality outdoor spaces to attract both daytime visitors and permanent residents from Middlesex and Union counties to the area. The new public square is designed to serve as an attractive, modern gateway to downtown Rahway at the southernmost point of the Main Street central business district. In addition to the existing library and the new public recreational center, the Town Center will include a shopping district (175,000 square feet of new Class A retail), 375 residential units (primarily rental apartments, condominiums and townhomes, as well as 125 hotel rooms) and various entertainment venues, such as outdoor theater and festivals. The plan, for which the city provided a significant portion of the land, would relocate the current City Hall and police station on site. The city hopes this development will generate additional patrons for downtown Rahway’s existing commercial and entertainment base. The Rahway Town Center grows out of the city’s strategic planning efforts to promote redevelopment and smart growth. The “Central Business District Redevelopment Plan,” of which the Town Center Master Plan is a part, encourages high-density mixed-use residential, commercial, retail and/or office uses. Rahway’s smart-growth efforts were further bolstered in 2005 when the area around the train station was designated as a “Transit Village,” a designation that provides state agency support for redevelopment activities around transit facilities. The Town Center heavily promotes non-vehicular modes of transportation. The new multi-use public plaza is within walking distance of the train station. In addition, a trolley system connects major downtown points, including City Hall, the train station and the new adjacent main 524-space parking deck, the Arts Center and the YMCA. The master plan also calls for creating an attractive pedestrian environment with walkways, plazas, sidewalk cafes, trees and landscaping, and emphasizes the street level as a critical activity focus. It envisions a diversity of retail and activity-related shops at the ground level and limits building heights to four stories. Visitors to the Town Center will also have access to the existing walking paths along the Rahway River waterfront only a block away. The conceptual plan and layout of the Rahway Town Center have been approved by the Rahway Redevelopment Agency and the City Council.